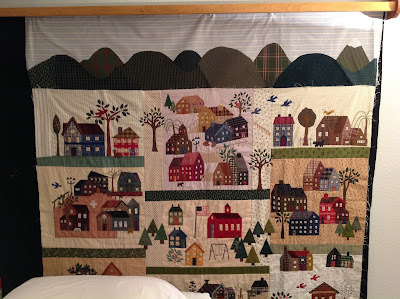 Quilting and Life in General: Life sped up on me! Sorry! Life sped up on me! Sorry! We're having a normal Oregon Coast winter. The last 2-3 years we have been in a drought. Not this year! And, well, you forget! I've been wishing life could be more like that movie - "The Truman Show" where it mainly rains at night - not all day!!! Welcome to 'partly cloudy' on the Coast! There's been a lot going on. I hosted the "Finishing School" in Bandon at the end of February. And yes, I got those blessed little pin cushions done! They turned out real cute this year - but I'm changing them up next year. I mean really, paper piecing is supposed to be accurate. But 3" schoolhouses that have one of the chimneys hanging off the roof just might be a sign that you're past that skill now! Yep, feeling old and arthritic!! We had added another day this year - and it was unanimous to do it again next year. The added day made the whole thing seem more relaxed!! There was no packing up the day before we left (by anyone else but me!) and that's unusual. Granted we had enough food and drink to last a few more days ... We have a full kitchen and we use it!! Our menu was varied and awesome this year! With lots of leftovers! But no leftover brownies!!!! I'm not in this picture - my Ipad camera refused to work for the clerk who was taking our group shot!! My DSIL's father passed away the night before Retreat ended. So I did pack up early and left at the crack of dawn (6:45 these days) to drive up to Portland and stay with the 'Littles' while L & J helped out with all the paperwork and arrangements that follow. Everyone has been doing okay. But no matter how old you are, you're not old enough to lose a dad. So I have recently become re-energized about Life and it's possibilities! There are several new projects I want to do NOW! There are a dozen UFOs I want done NOW! And here's where it gets murky! I don't want someone else to do them. I want to do them and yet have them finished fast! 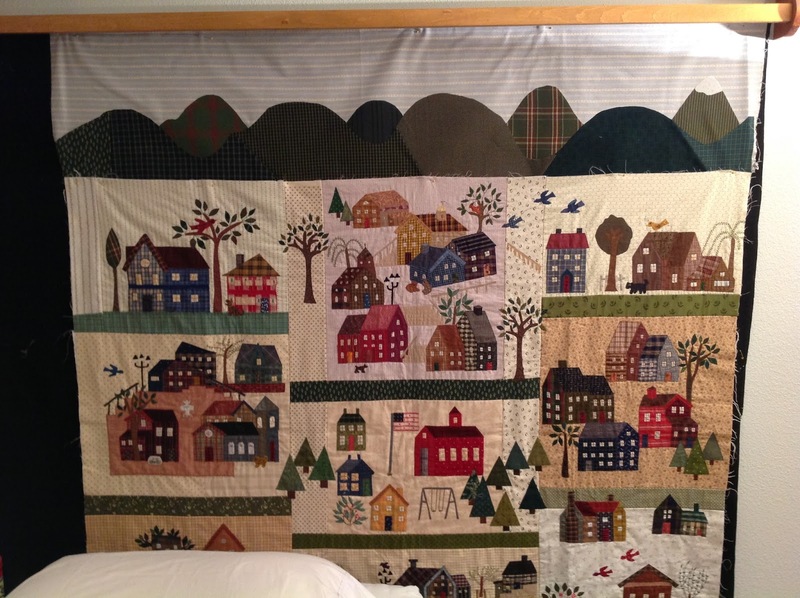 Here is the QuiltMania BOM of a few years ago. I love the house blocks and even made up extra blocks to complete my town. I'm "auditioning" the mountains border - I've been told it's too dark. And this is my favorite "new" project. This year, three of us quilting maniacs in our small town decided to split a subscription of the three QuiltMania magazines. So far it's been very distracting! 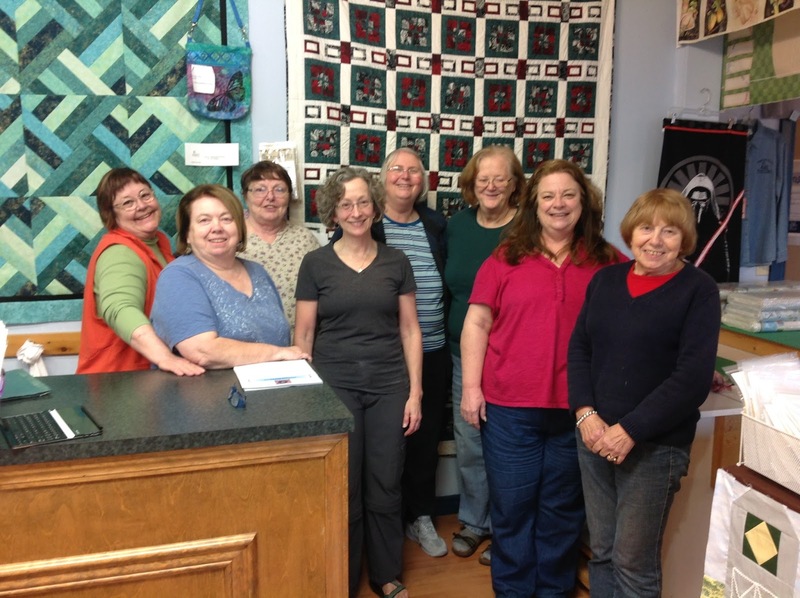 When we got QuiltMania P and I fell in love with the "Camelot" quilt in it. We gathered fabrics and worked on it at Finishing School. Well, I dropped out after the first hour! I could not get the curved piecing to curve!! P journeyed on ... until the 2nd block - then she was joining me "at the burn barrel"! 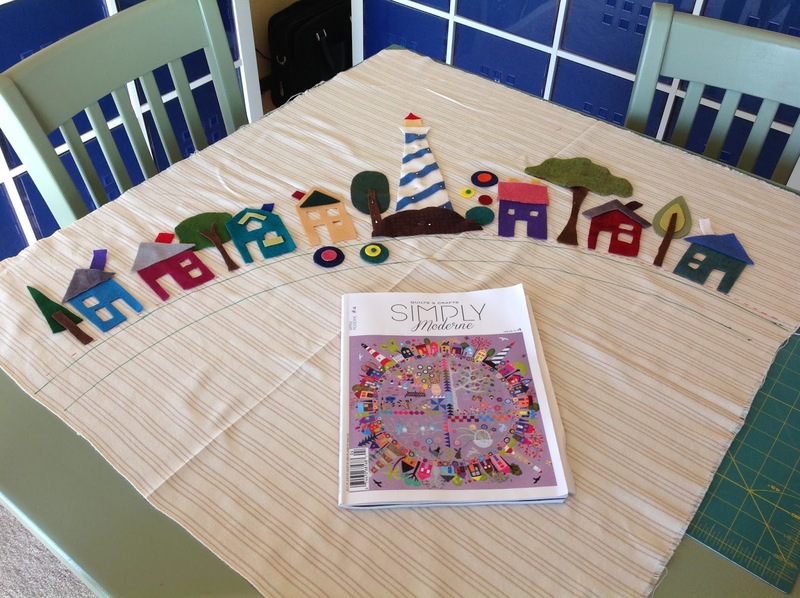 So this is our first Simply Moderne issue - and we fell in love with the cover quilt! I didn't like the mauve background (I don't care if it IS coming back!) BUT when I read further and the appliques were wool - Celebrate! They had me then!!! But after our misadventure with the Camelot blocks - well we decided to do the first quarter and if we didn't like it - it would still be interestingly asymmetrical! I'm using beige-ings for the backgrounds, a different one for each quarter. There are a kazillion wool circles on this. Trying to figure out the easiest, cheapest way to produce them! Don't want an Accuquilt - small apartment, no storage, no room. Tried some circle punches, hard on my hands. Bought a package of 30 precut 1" circles at the Ashland Quilt Store, but don't want to spend .16 on each circle! Right now I'm trying to draw circles (from handy dandy template - $5!) onto freezer paper and fusing that to the wool and cutting them out. They aren't perfect, no surprise, but neither are my houses! And my hands seems to hold up to that. I cut 68 last night watching tv! BUT always open to a better way! Suggestions?? I also want to lose weight; read books; watch the DVR programs; spring clean and declutter, increase our savings; cook healthier meals; .... but oddly, not take a nap!!! (I always crave naps when I have too much to do!) So whats your favorite method to work on everything at once?? I don't think the "scatter shot" method is my thing! Last week we were back in Portland (in the rain) for the Memorial service. We went up early to spend an extra day with the 'Littles' and spoil them too. We played games, including a Disney Trivia game - our 9 year old expert showed us who's the boss! Then after school was the big chess match - will Papa keep his winning record?? Nope, he did not. This is really a BIG DEAL! Papa doesn't dumb down his game for children!! Mr M was beaming! Before we came, I repaired a cute little denim skirt for Miss P and have decided against ever doing that again! 5 hours later ... I ended up making the waist like a PJ bottoms waist. Sewing in the elastic is apparently not completely covered in the tutorial! When I got it sewed in there were strange little hard sticky-out parts along the waistband. Uneven stretching of the elastic???? Don't know, but it's a PIA to rip out!! I had asked my DD to measure waist to bottom of hem on Miss P - she "guesstimated" and last night I had to raise the hem by hand!!! Sigh! All I can say is it better be her favorite skirt and I should see her in it a lot! We came home, I attended our "March Madness" sew in for quilt guild and we left to babysit the other "Littles" the next morning. Still raining thru all this traveling and adventures. Had a great time with the boys; had a lot of light saber fights with short pool noodles. Went to the science museum and I had as much fun as the Littles did! Maybe more! Coming home across the mountain, still raining and the river was in flood stage - we've never seen it so big and fast! But home again, home again. I'm ready to stay for a few weeks, no travel for me, please. Not for a while at least! That coastal rain is so BAD. I was in Portland over the weekend. Be safe. You have been BUSY! Nice to have a Finishing Retreat. No need to apologize, being Grandma is too FUN.